This artistic view shows an accreting supermassive black hole at the core of a galaxy. 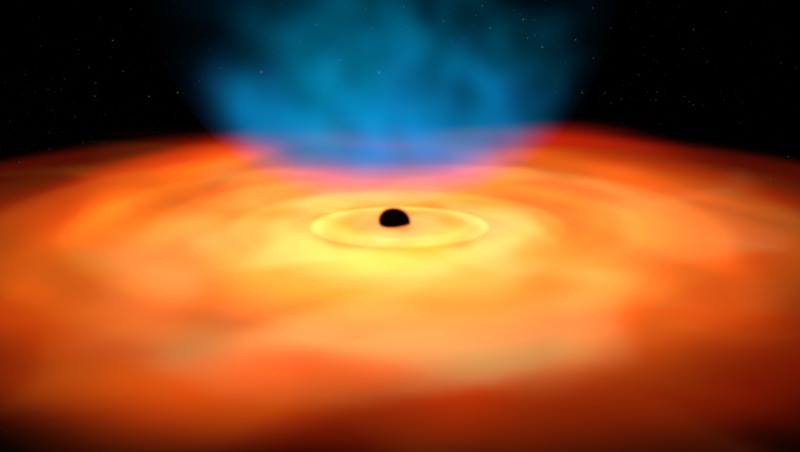 Actively accreting supermassive black holes devour matter at very high rate, causing the surrounding material to shine brightly across the electromagnetic spectrum, from radio waves to X-rays and gamma rays. In some cases, emission from matter in the vicinity of the black hole is so intense that the core of the galaxy outshines the total luminosity of its stars: as a result, these objects appear as point sources in the sky, like stars, and are known as quasars – short for quasi-stellar sources. As the accreted material flows towards the black hole through a disc, it is heated by friction and shines brightly at visible and ultraviolet wavelengths, shown here in red and yellow, respectively. Part of the light emitted by the disc interacts with highly energetic electrons in a corona near the disc (shown in blue), receiving an extra energy boost and turning into X-rays. In the 1970s, astronomers identified a link between the amount of light emitted by quasars at ultraviolet and X-ray wavelengths, which is not linear. The fraction of a quasar's X-ray luminosity is not fixed, but depends on the ultraviolet luminosity: the higher the ultraviolet emission, the lower the ratio between X-ray and ultraviolet luminosity. For this reason, the observed ratio between a quasar's X-ray and ultraviolet emission can be used to estimate the absolute luminosity at ultraviolet wavelengths. As suggested in a study by Guido Risaliti and Elisabeta Lusso, this relation can be used to estimate distances to quasars and, therefore, to investigate the expansion history of the Universe.